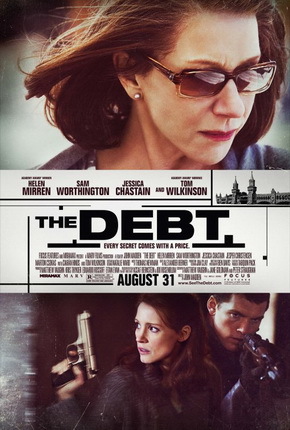 "The Debt" is the 2011 remake of the 2007 Israeli film of the same name, which translates into "Ha-Hov" in Hebrew. The film is about a group of three Israeli Mossad agents, a woman and two men, chosen to capture a obstetrician named Dieter Vogel, who is dubbed "The Surgeon of Birkenau." He stands accused of killing Jewish people during World War II, something he is secretly proud of and strangely so. The trio's plan goes awry and they end up lying to the public about capturing and killing Vogel. It leads to fame, but guilty consciences. During the sad film, what was to be a capture, becomes a messy mission for revenge, that consumes and destroys the agents. It is an example of how a lie can mushroom and destroy.